This page contains news items that recently appeared on the home page. They are listed in reverse date order - most recent first. News from earlier has been archived - click on the links to view. In all the activity of the last two months we should remember that we raised money for Children-in-Need back in November while we were operating from Oxford City Football Club. Your Treasurer apologises for an error in the calculation of the total donations. In fact the final total was £1,037.41 - many thanks to all who contributed and especially to the team that did the work. The calendar shows the detailed status on all the sessions. morning and Friday morning. All the sessions are now hosted. Our architects for the extension and refurbishment at the club are Gray Baynes and Shew. They have published a short article and some additional photographs about the project on their website here. Building project completion was celebrated before the bridge on Wednesday. Plaudits all round to the OBC team, the builders (Wooldridge and Simpson), the architects (Gray Baynes and Shew) and the quantity surveyor. Our appreciation also recorded to Oxford City Football Club who provided us with a temporary home between Easter and Christmas. We now have a plan for moving back home. You can see the latest photographs of progress at 147 Banbury Road elsewhere on the website. Everyone is now working very hard to ensure that we achieve this transition as smoothly as possible but members must be aware that we are moving into a completely new facility and it may be that things will not be perfect – that will follow! Please try to help those who are setting everything up for you to ensure your comfort and enjoyment. 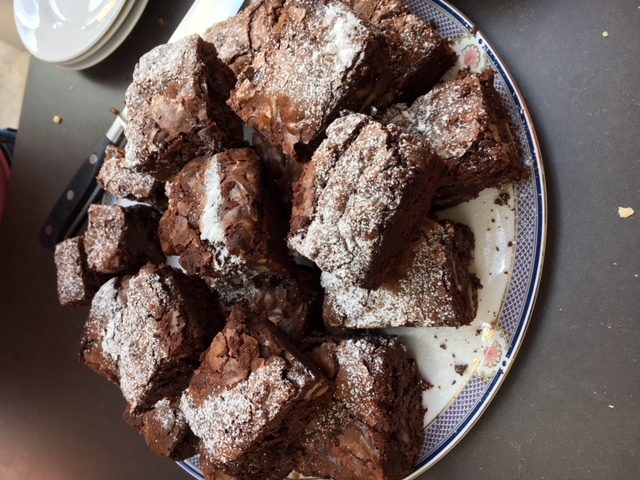 We wish to thank all our members who have so very generously supported us in the fund raising, and record that we have reached our target with a little to spare! Unfortunately there was a negative response to lottery funding. Members will be receiving an email from the chairman about two opportunities in the first week to celebrate the return to the club, to see the wonderful result achieved by the building team and to toast the health of the club. Great start to the bridge; many others visited over lunchtime. New main playroom ready for play tomorrow morning! OBC took possession of its new clubhouse today! Here are the three playing rooms waiting for you to start play. A very generous benefactor has offered £1 for each £1 donated by members until the end of November provided we complete the state of the art sound and audio system costing £34K. Donate £50 add £50 plus gift aid equals £125! What a bargain. We should make full use of this amazing offer. Your donation of any size is really welcome. You can donate directly by making an electronic payment to the charity's bank account - the same one as you pay your member subscription to. If in doubt, contact the Treasurer or the Chairman. Click here for additional details on the fundraising programme. Thank you for whatever donation you are able to give. Your commitment to your Club is much appreciated. Those who follow football may know that Oxford City Football Club drew an FA Cup match with Tranmere Rovers last week. The replay is now scheduled for Tuesday 20th November. Although the match is not until the evening, the preparations for the match which is to be televised on BT Sport mean that the facilities that we normally use on Tuesdays will not be available all day. This year we will play the Children in Need SIM Pairs on two days - Tuesday morning (13th) and Wednesday evening (14th). There will be a raffle all week. Slices of donated cake will be sold at the Tuesday morning and Friday morning sessions. The fundraising will finish in just over two weeks time. It's your last chance to show your support for the club. Many congratulations to Diana Thorne & Brenda Macdonagh who won the ladies' pairs competition and the Doreen Simpson trophy. Many congratulations also to Ian Foote & Herman de Louw who won the men's pairs, and the John Simpson trophy. Full results are listed in the Results section in the left-hand menu. As part of the Access to Headington roadworks, Marsh Lane will be closed between 7.00pm and 6.00am from the 15th to the 25th October from the roundabout by Marston shops to the junction for the bypass. Having consulted with the Access to Headington team at the council, access to the OCFC site will be possible from the bypass direction only. There will be an access restriction – stating for residents and access only. They will allow drivers through to come to the site but there may be a significant delay at the barrier. On Tuesday evening some of those arriving after 7.00pm reported delays of up to 30 minutes. Please allow extra time to get to the OCFC site and expect to be stopped and asked why you need access. If you come from the Marston direction – you will need to divert back to either the Headington or Cutteslowe roundabouts and back down the bypass. When you leave OCFC intending to travel clockwise around the ring road the straight ahead option may be blocked off - in this case take the left fork then immediately take the right turn to return to your intended road. Further details from the council here and here about what is being done in the roadworks. An enjoyable weekend was spent by eight members of the club when they joined the Acol Bridge Club weekend holiday at Hever in Kent on an October Friday evening. With a mixture of social time, friendly bridge sessions and two teaching events, there was time left over for a walk to Hever Castle before the end of the activities around 4.00pm on Sunday. An encouraging quote from one OBC attendee - "Would I do it again? Yes!" We are holding a Charity Bridge Drive with Chicago scoring at Cumnor Village Hall on Thursday 11 October to raise extra funds for the refurbishment of the club. Entry fee £20, to include lunch and a glass of wine. Entries are now being taken. Please click on this box for further details and an entry form. For further information please contact sue.smith@oxfordbridgeclub.com. Congratulations to Sue Smith and the Social Committee who organised this event at Cumnor Village Hall. The day raised more than £1200 in aid of the club building project. The photos show lots of people smiling - thank you to them all. Thanks also to Irina Woods and Roger Smith for the photos - hover/click on a thumbnail for a larger picture. There was a great response to the survey that was sent out to members in late August 2018. A big thank you to all of the 244 members who responded with their views on the priorities for our club premises. Click here to read the report. 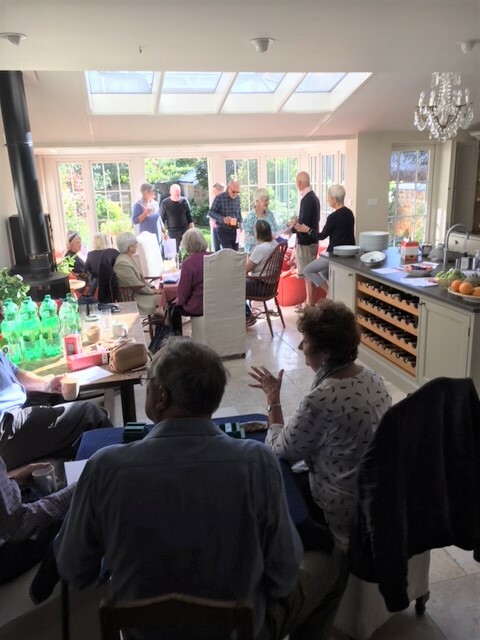 Sandra Devaney held a very successful lunch and bridge day for twenty people at her home which raised over £500 for the club. Everyone seemed to enjoy it enormously. 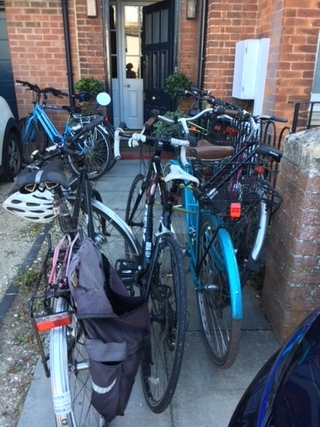 It's obvious we will need the bicycle parking space when we return to 147 Banbury Road! AMAZING progress - only £10K to go. A BIG thank you to all the members who have made donations so far. Your donation of any size is really welcome. For example we are estimating £85 for each new chair. To donate to our campaign please click on the JustGiving logo which will take you to the OBC campaign page. Alternatively, you can donate directly by making an electronic payment to the charity's bank account - the same one as you pay your member subscription to. If in doubt, contact the Treasurer or the Chairman. A BIG thank you to all the members who have made donations so far. See progress towards our goal on the right. Our target is unchanged, but we do need to reach it to complete our task successfully. Alternatively, you can donate directly by making an electronic payment to the charity's bank account - the same one as you pay your member subscription to. If in doubt, contact the Treasurer. As members know, we are currently fundraising to be able to complete the clubhouse to the best possible standard, and install all the features needed for a modern high quality bridge club. We have a target of £75,000, and progress is being shown on the thermometer on the wall at OCFC. We are happy to take donations direct into the charity's bank account, and we have also launched a campaign on the Just Giving website. Clicking the button below will take you direct to our campaign page. All donations are welcome, large or small. Thank you so much for anything you are able to contribute. Many congratulations to Liza Furnival and Nigel Birks for coming fourth in the Swiss Pairs and second in the Swiss Team event last weekend. Their Swiss team mates were Lorna Swadling and Alastair Gidman, so very well done to them too. Congratulations also to Christopher Whitehouse, Mary-Ann Sheehy, Michiel Cottaar and Emily Middleton who came fourth in the Swiss Teams, and to Laura Covill and Daniel Gullberg for coming joint eighth in the Swiss Pairs. Congratulations also go to Alex Wood and Duncan Thomas who won the Friendly Pairs event held on the Sunday afternoon, and to runners-up Mary Bennett and Clodagh Jacubovics. Alex and Duncan win the Sandra Landy Trophy. Full results and photographs are available on the Oxfordshire Bridge Association website. Many congratulations to Juliette Riehl & Chris Bone who are the club's Novice Pairs champions for 2017-2018. They will receive the Morrie Marsh Trophy at the AGM in July. The Novice Pairs competition was held on Monday 21 May, and is open to novice players who are members of the club. Congratulations to Henry Rose and Laura Covill who have been selected to represent England in the World Youth Team Championships being held in China in August. Henry will be playing for the under-16 team, and Laura for the Women's under-26 team. We wish them the best of luck. Further details are on the EBU website. Many congragulations to Diana Thorne & Peter Randall, who have won the final of the club's knockout rubber bridge competition, beating Howard Arnes & Bridget Watson in a closely fought match. Diana and Peter win the Meltzer Trophy. The full draw for the competition can be viewed HERE. The club first team – Oxford A – have won the first division of the Wessex League for a second year running. They now have an unassailable lead and still have one match left to play. So far that's 6 wins in 6 matches. The regular team is Aleks Lishkov, Beryl Kerr, Denis Talbot, Diana Nettleton, Emily Middleton, Kathy Talbot (Captain), Mary-Ann Sheehy, Matthew Covill, Michiel Cottaar and Peter Briggs. Thanks also to Andy King and Carol Benzie who stepped in to help when needed. Congratulations to all the team on the successful season. You can view the League Table here. Linda Edwards (Mon morning pairs), Gwen & John Turner (Tues morning pairs), Beryl Buckley (Wed afternoon gentle duplicate), Aleks Lishkov (Wed and Fri evening pairs), Kathy Talbot (Wed evening teams), Sandra Devaney (Thurs evening gentle duplicate), Diane Coe (Fri morning pairs) and Liza Furnival (Fri evening teams). The full ladder results can be viewed on the website here. Click an image for further details of our temporary location. Club activity resumes back at 147 Banbury Road from 10th December 2018. For further detailed information about getting to Oxford City Football Club click here or download a two page flier that you can print. OBC will play using new table arrangements from the start of the new financial year. The Director of each session will now use a whistle to indicate the start of play and to signal the move for the next round. No player may leave the centre circle during play. Oxford Bridge School is delighted to present two seminars on teams play with Michael Byrne. These will take place on Saturday 17th March 2018. Michael is a professional bridge player and teacher, based in Manchester. As well as significant successes as a player, he has coached several junior teams to international success. morning session for intermediate/advanced players. This is likely to suit you if your NGS lies between an 8 and a Jack. afternoon session for expert players. This is likely to suit you if your NGS is Queen or above. In each of the seminars there will be a presentation, discussion, and a chance to practise putting your newly acquired knowledge into use. Some of you may recognise the pink blinds in this photograph! Those of you who are following the success of Junior Bridge in the county might like to read the article on the EBU website written by the England U16 Squad leader Giorgio Provenza. It references the persistence and success of the Oxford Junior Bridge Club effort lead by Holly Kilpatrick and supported by a number of other OBC members. The EBU's annual masterpoint ranking lists for 2017 are now available on their website. Many congratulations to our Club Champion, Robert Gasser - he won a total of 2180 Masterpoints during 2017. The full Oxford Bridge Club masterpoint leaderboard is here. Many congratulations to Aleks Lishkov, who came fourth in the National rankings. And many congratulations also to Henry Rose, who came 21st in the Junior rankings. Aleks is also top of the table in the Oxfordshire rankings. In fact most of the top places in the Oxfordshire rankings are taken up by OBC members. Well done to them all. Following the presentation by our architects at the Christmas party on 13th December, we were seeking your views on which of two possible interior finishes you would prefer. The consultation phase is now complete. Thank you for all your responses and comments. If you want to review the "mood" boards you will find them in the section of the website on property refurbishment. Many congratulations to Irina Woods & Irene Holland who won Oxford Bridge Club's pairs championship, held on Sunday 22 January. They win the Beck Salver. Second were Howard Arnes & Ruth Kim, and third were Nigel Birks & Liza Furnival. Well done to them too. Full results are available via the results calendar. Update: after consultation with the EBU, the original results have been adjusted to take account of the fact that two boards were played only twice. This has resulted in some changes to the final order. Please contact the Chief Scorer if you would like more information as to how and why the results have been adjusted. Please click on title to open link to the County Newsletter.